Italy: Rome, the Forum, Temple of Castor and Pollux. 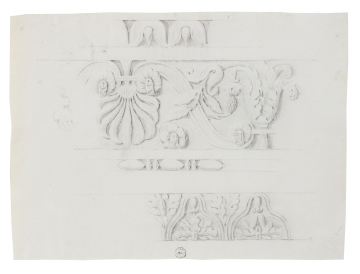 Record drawing showing three architectural details. At the top: two husks and ovolo cornice; below this: anthemion and foliage frieze; at the bottom: two parts of foliage cyma reversa. You are here: CollectionsOnline / Italy: Rome, the Forum, Temple of Castor and Pollux. Record drawing showing three architectural details. At the top: two husks and ovolo cornice; below this: anthemion and foliage frieze; at the bottom: two parts of foliage cyma reversa. Unfinished pen drawing showing foliage details. The hand is probably not that of the drawing on the recto. All three details are taken from fragments of the Temple of Castor and Pollux at the south-east end of the Forum, of which three Corinthian columns and entablature survive.